In my last posting I walked through some exterior items to look at after a long, cold winter. Let’s turn to the inside next. 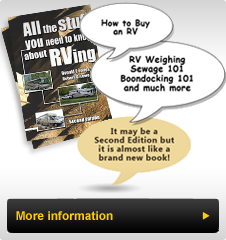 While I am biased, many RVers have found our book: ”All the Stuff You need to Know about RVing” to be a good guide to items to check when preparing to store and when preparing to take a RV out of storage. With hundreds of hints it is a good guide and reference book that is easy to read. It is a good idea to refer to your RV owner’s manual and accompanying documents to ensure each component is returned to service properly. I like to start with the main systems and work from there. To get everything going, one needs power thus the condition and state of charge of the 12Volt Coach and Starting batteries is crucial. If they were removed prior to the winter, fully charge each one, then reinstall following the proper layout of the cable connections that you made prior to removing them. A photo and properly labeling each cable connection makes this task easier at this time. Taking photos and printing them out is a good way to remind you of the exact connection. I recommend connecting the positive cable connections first and then connecting the ground or negative connection as the last connection. If your are readying a motorized RV then after checking all fluid levels for the proper level, then start it up and check that all instruments are reading as expected. The alternator should be providing charge to the chassis batteries and the coach batteries at this point, although if the chassis batteries were not fully charged, the priority for the charging will be the chassis batteries. With all interior items properly stored for travel, doors shut, drawers left open over the winter now closed and everything properly secured, take the RV for a drive. If the emergency brake was left on all winter (common for air brake equipped coaches) it may be necessary to gently back up a small amount to break the shoes away from the drum if they rusted together. Then drive ahead slowly and apply the brakes evenly a few times to ensure that all pistons or shoes are functional and brakes are operating. If all proves out then take the RV for a drive allowing the transmission to get up to operating temperature. Check for any unusual noises, squeaks, smells, rattles and so on that may require your attention. If there are unusual items, investigate them now, if safe to do, or when you stop, so that these gremlins do not develop into bigger problems during the RVing season. Upon your return, check your generator fluid levels and start it up. Place a load on it by running a rooftop air conditioner or two (set to cold or a low temperature) or turn on an electric heater set to "HI”. Let it run for 30 minutes under load and ensure that power generated is in the correct voltage range and that it has the capacity to handle the loads, while running evenly.